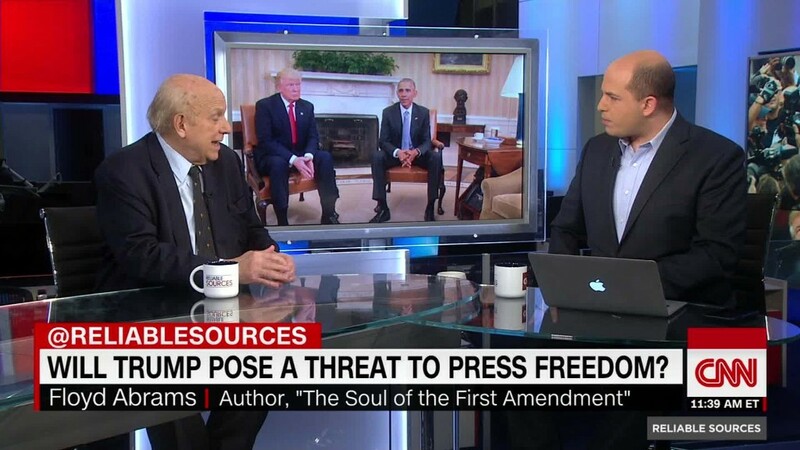 How could President Trump limit press freedom? Some of the country's top journalists issued stark warnings about the importance of protecting First Amendment rights on Tuesday night, two weeks after Donald Trump was elected president. "This year the threats to press freedom are quite close to home. It's right here," New Yorker editor David Remnick said at the Committee to Protect Journalists dinner in New York City. "I never in a million years thought I would be up here on stage appealing for the freedom and safety of American journalists at home," CNN's Christiane Amanpour said. Amanpour called on the journalists in attendance to "recommit to robust fact-based reporting" and to fight "against normalization of the unacceptable." Trump's attacks against the American media were a recurring theme during the annual dinner, which focuses on threats to journalists in repressive regimes. "We will hold the new administration's feet to the fire. And they should respect that, even if they don't welcome it," CNN president Jeff Zucker said. Sandra Mims Rowe, the chairman of the committee, said erosion in media rights in the United States "would further imperil journalists everywhere." "The United States simply cannot provide ammunition to anyone whose goal it is to silence a critical press," she said at the beginning of the evening. Amanpour backed up that view in a passionate speech at the end of the night. She said journalism is facing an "existential crisis" caused by politicians denying the media's legitimacy; fake stories passing as real news; and journalists failing to rise to the occasion. She urged journalists to "stand up together" to defend the profession. She also urged colleagues to look inward. "We, the media, can either contribute to a more functional system or to deepening the political dysfunction," she said. "Which world do we want to leave our children?" Amanpour concluded her remarks by saying the press should "fight to remain relevant and useful." Looking ahead to Thursday's holiday, she said, "Let's resolve not to be turkeys voting for Thanksgiving!" Trump's extreme, hateful anti-media rhetoric before election day included some suggestions that freedom of the press has been too broadly defined and should be reined in. On Tuesday afternoon Trump was asked during a meeting with New York Times editors, "are you committed to the First Amendment to the Constitution?" "I think you'll be happy. I think you'll be happy," Trump answered. Trump also met with anchors and executives from five major TV networks earlier in the week, but the substance of the meeting was off the record. Zucker, the chairman of this year's press freedom dinner, alluded to that meeting in his remarks on Tuesday night. "I want to use this occasion to reiterate what I said directly to the president-elect yesterday," Zucker said. "As the new leader of the free world, we expect that he will preserve longstanding traditions that ensure coverage of his presidency." Zucker specifically cited the importance of the "press pool," a small group of journalists who travel with the president and report on his actions. "The role of the press is vital to our democracy," he said. "This is not about access for the press itself. It is about access for all Americans." Zucker said "it is still too early to draw conclusions about how this administration will work with the media," but, "I think it is fair to say that based on some of what we saw during the campaign, we have some reason for concern." "That sentiment was expressed yesterday to the president-elect from those of us who met with him," he added. "We take our roles very seriously." Remnick began the dinner by paying tribute to Gwen Ifill, the PBS anchor who died last week. Alluding to the incoming administration and the widespread concerns about press freedom, he said she died "when we need her the most." Channeling Ifill, Remnick said journalists should "report into the teeth of the current atmosphere" and act "fearlessly." Zucker also spoke about Ifill's impact and congratulated Amanpour. "We are fortunate to live in a nation where tenacious journalists like Christiane and Gwen can challenge authority without fear of reprisal," he said. "We must collectively ensure that this remains the case here at home, while we continue to fight for these values around the world."